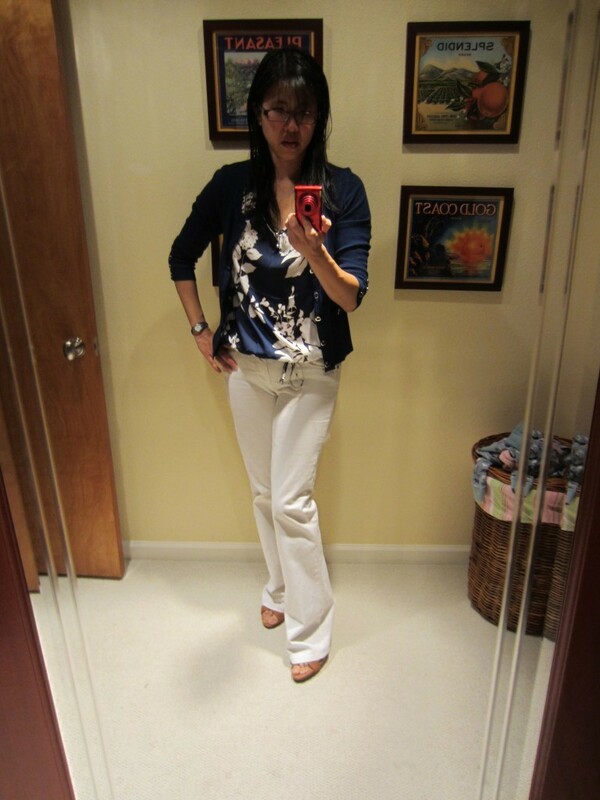 OK, after yesterday's grey pants and blue button down shirt outfit that bored me to tears, I decided to give pants another shot and try to wear a pants outfit that felt more like my usual style. 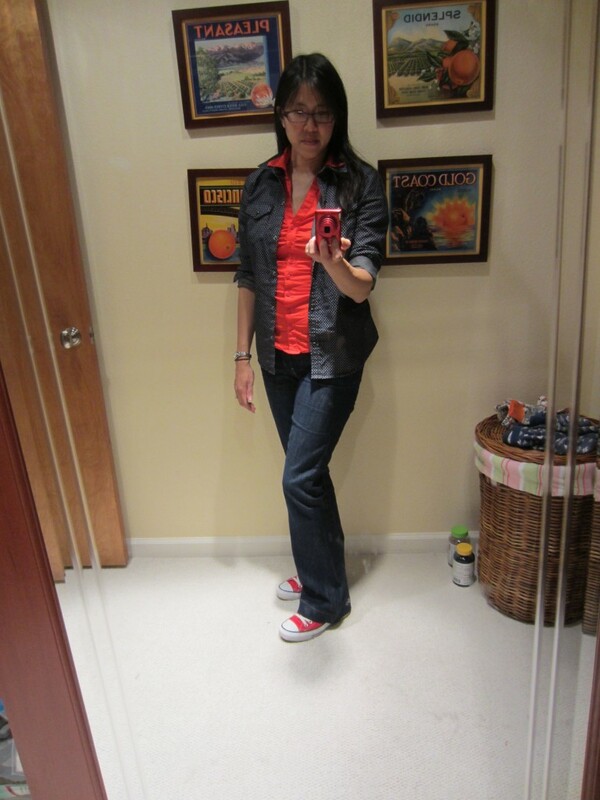 I wore some Gap Modern Bootcut trousers in red (size 4, unfortunately they've bagged out a bit over the day) and my black Anne Fontaine button down blouse. 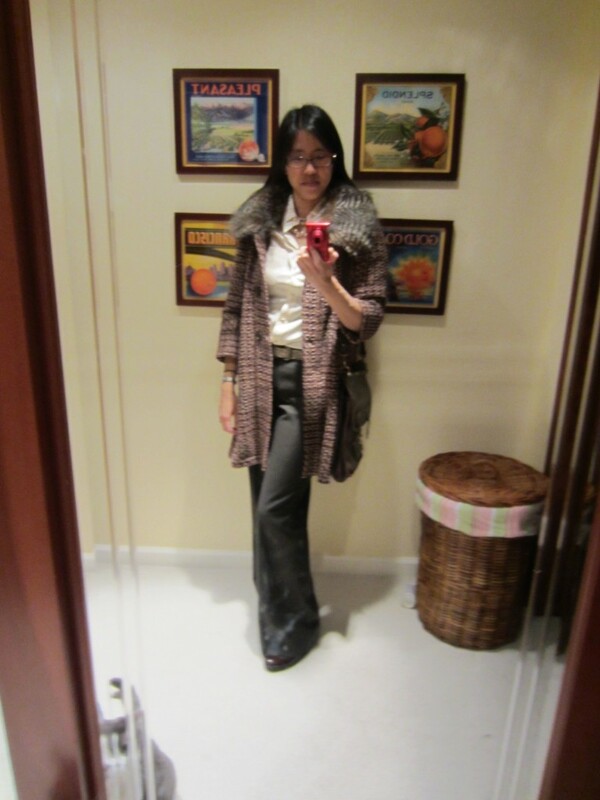 I added a Jason Wu for Target Milu cat scarf for my required dose of whimsy, then the Kate Spade trench for one of my signature pieces, and the structured WHBM red snakeskin handbag. 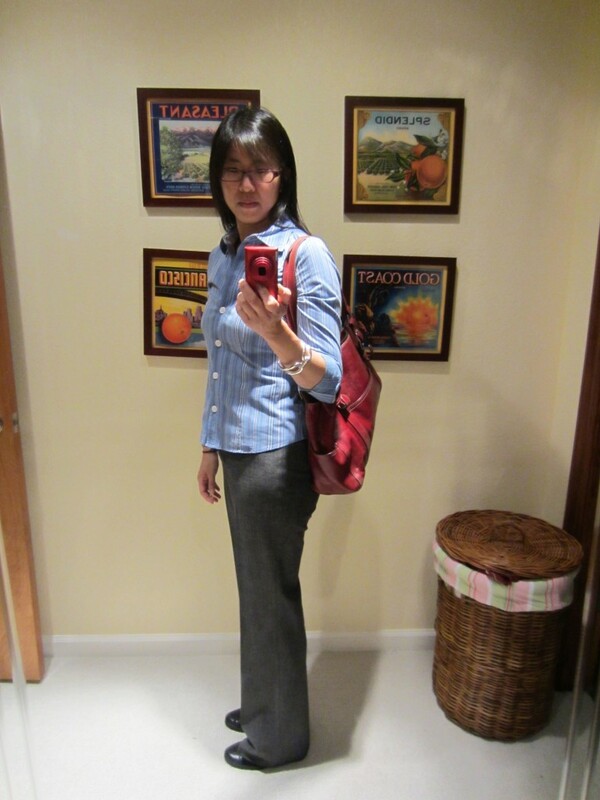 I was originally planning to wear black Mary Janes, but the pants were too long for mid-heel pumps so I had to wear high heels. 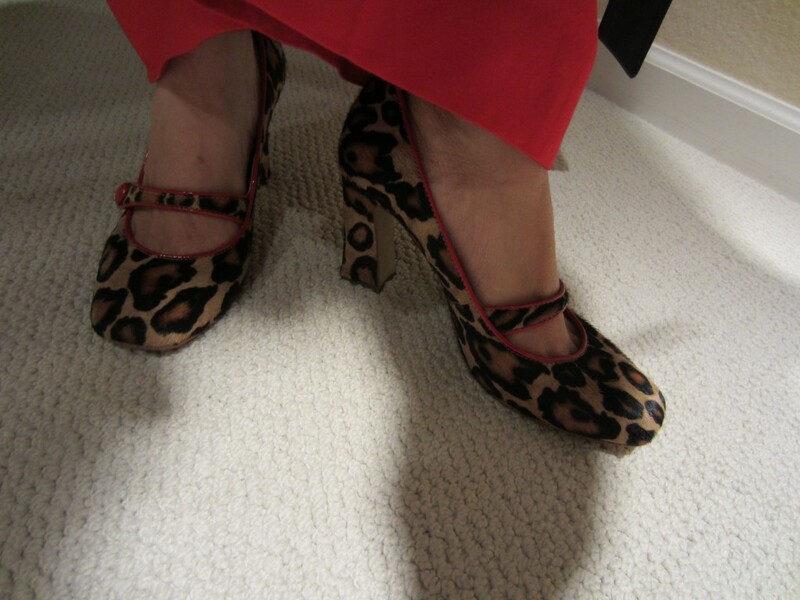 So I decided to wear the leopard print B Makowsky Heist pumps with red trim. I didn't intend to do pattern mixing and double cat prints, but why not, it's more fun that way! 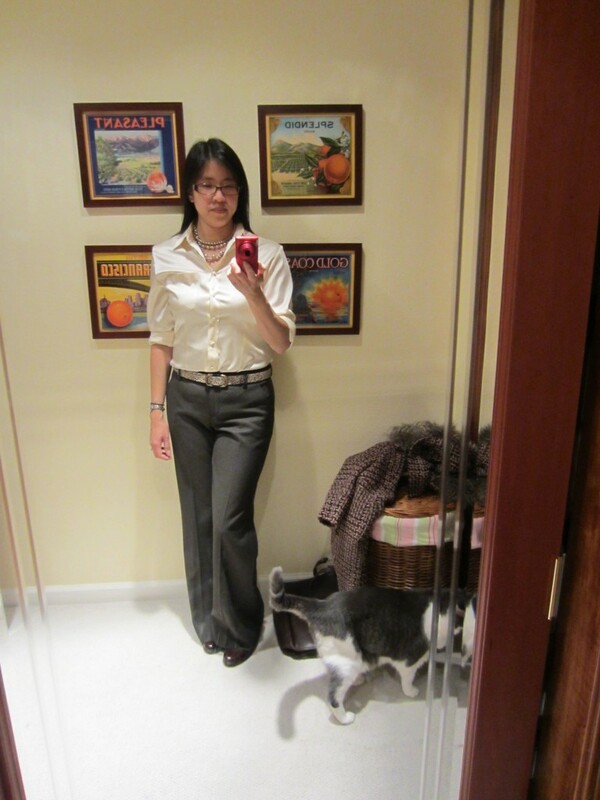 I think the week of pants was helpful because I realized that I can wear pants and make them my style, it just takes more effort (thinking about pants length, making sure the top is more interesting, which shoes you can wear with what hem length, etc). Here's the week of pants in review--vote for your favorite! I love the shoes in #5 and the casual outfit in #12. I am torn on the dressy pants outfits, I like the look in #6 best I think, but I think I am a bit on the poisoned eye side for red and black right now. I like the idea of setting up your own challenge week, what a fun way to get creative with your wardrobe! #1 and #8. You do the casual MOTG jean look really well (definitely making it your own) but these two have all the accessories and pizazz that I think of on you. Your mantra seems to be "no more boring...." and it works for you. That #7 photo is SO DELIGHTFUL! 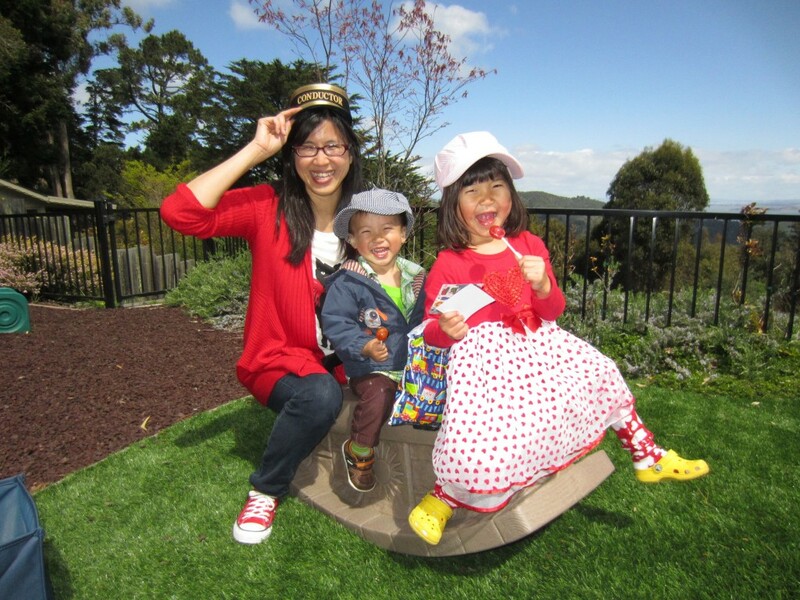 Thanks for sharing the smiles! You know, of course #1 is awesome --- gives whole new meaning to 'Hello, Kitty!' LVOE those shoes! That said, I'm voting #6 and #10/11 as my joint favourites, precisely because they are so apparently simple and straightforward, yet so very Natalie-in-pants. Good going with this challenge! These are all so good, I find it very hard to pick a favorite. I love the polished look with the scarf in #1. 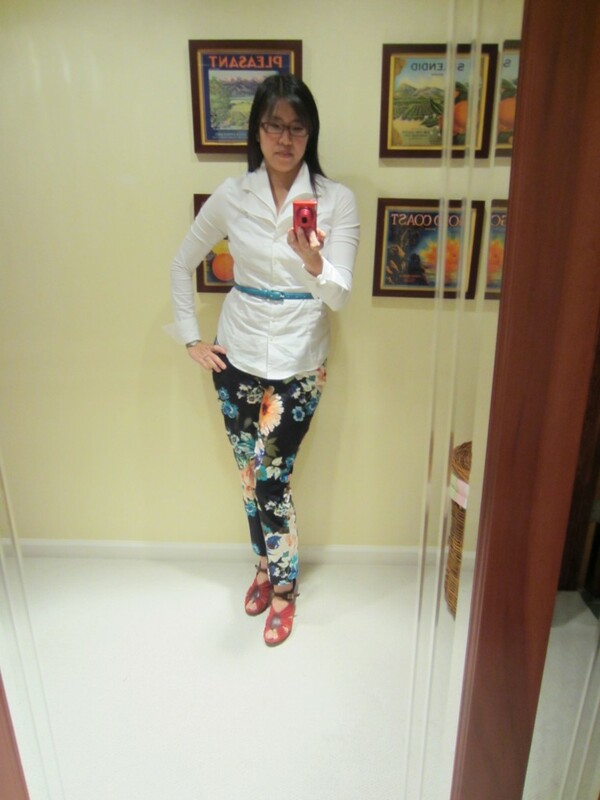 But I have to say, I like the cropped floral pants outfit best because it is so fashion-forward. This is a look that could easily bomb. Yet you pull it off and it is flattering and "you." I like all these looks really. 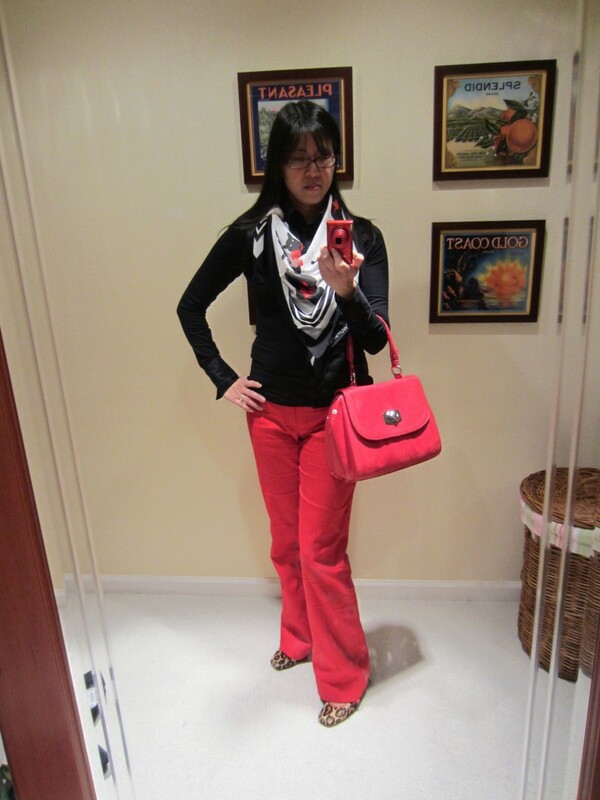 The red boot cut pants are very cool and I adore that cat scarf. 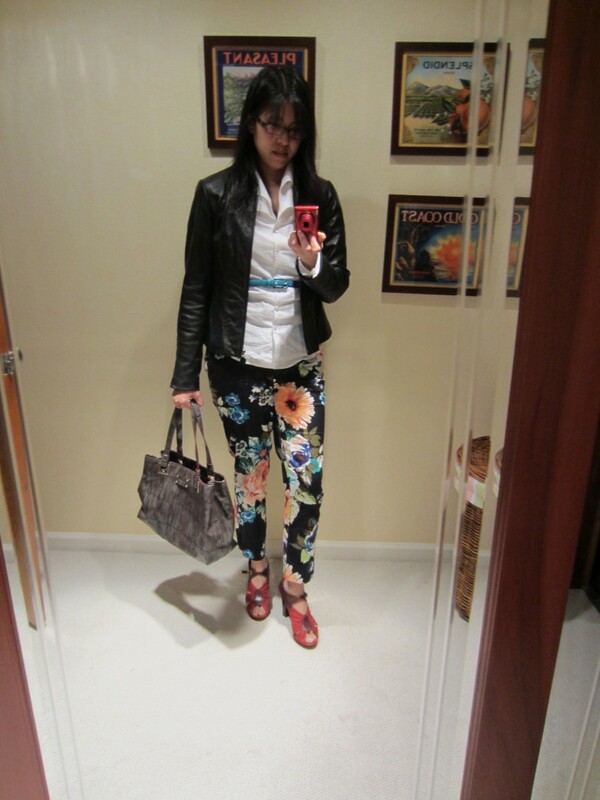 The floral pants are fabulous, so much so that you are making me want a pair! Natalie, I think you wear pants very well. I love #1 and #8 but I'm voting for #6 because it is crisp, effortless looking and says Spring to me. Glad you have your pants mojo down! The red pants outfit is perfect! Welcome back gorgeous! 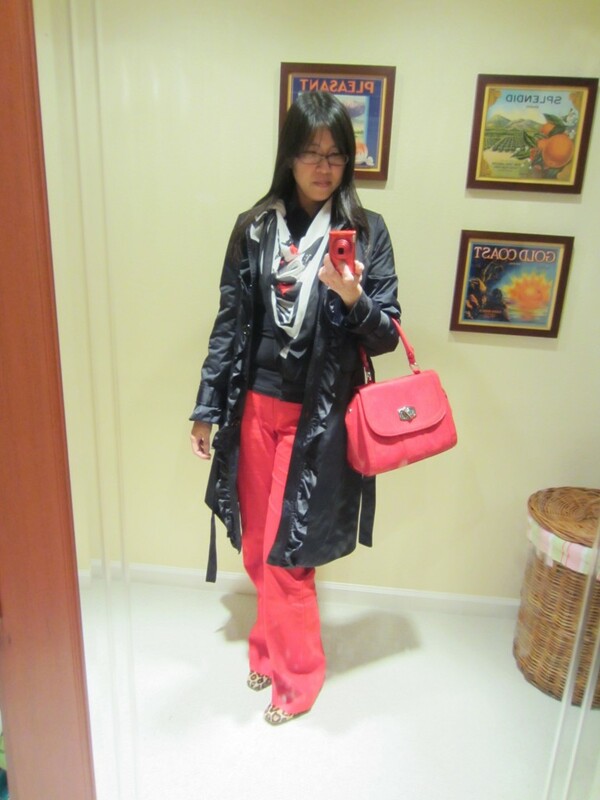 I adore outfit #1 - of course I love red and black. 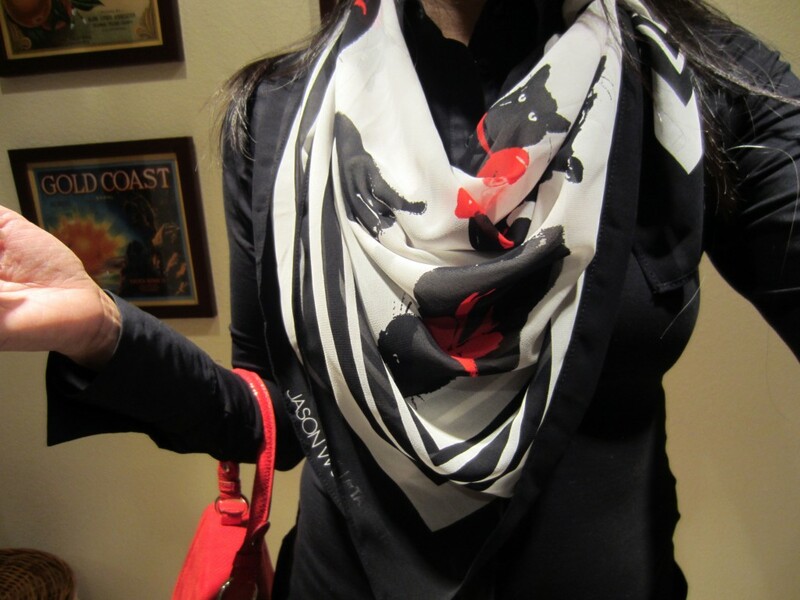 I adore how the scarf is so casually draped and tied, almost like you decided to just "toss it on" - but it's the perfect finishing touch for this outfit and c'mon...who does love kitty cats?! The animal print shoes are perfect with this combo. I also love the outfit in #6 - crisp, clean and fresh. The others I had commented on their individual threads so won't repeat myself. 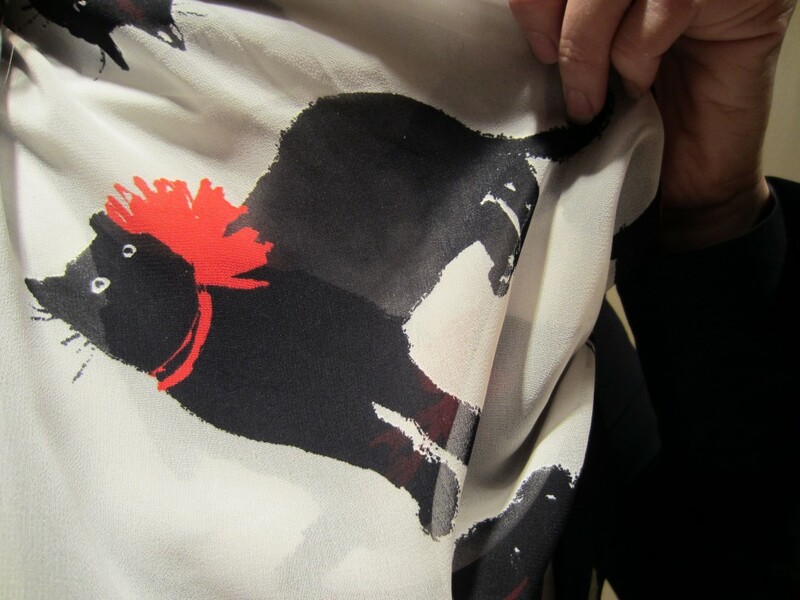 Oh my goodness, I love that cat-print scarf, and your real cat too! You are rocking the printed pants trend. Your family is so adorable!!! Yay! You've clearly mastered the pants thing! and #10 is so elegant. When you take the coat off, it doesn't have the *personality* like #2 does, but it sure is classically chic! Natalie, your outfits make me smile :). Thanks for that! Love #1, #2, #6, #10 and #11. So gorgeous!